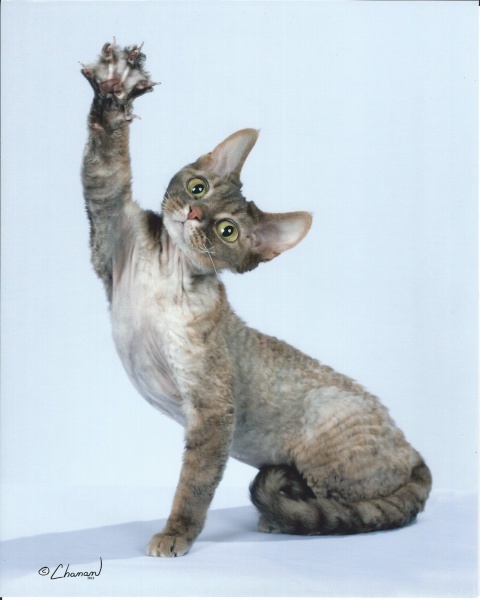 The Devon Rex has been referred to as elf, pixie, and alien like. They have large ears, set low on their head. Their eyes are large, oval and wide set, slanting toward the outer edge of their ears. They are a medium sized breed with dense bodies. Their soft, fine, full -bodied curly coat is what makes them a Rex. This breed is more hypo-allergenic and shed very little. This makes them an ideal pet for people with allergies. Devon's have a whimsical personality. They fetch like a dog, perch like a bird and climb like a monkey, but they are the first to snuggle up with you under the covers. If you don't want a constant companion in whatever you are doing, the Devon Rex is not the breed for you. Whether you are watching t.v. or working on your computer, your Devon will be right by your side trying to help.